Tito Mata believes that a healthy body and a healthy mind equal success, and wants to steer others — especially young people — in the direction of his passion. 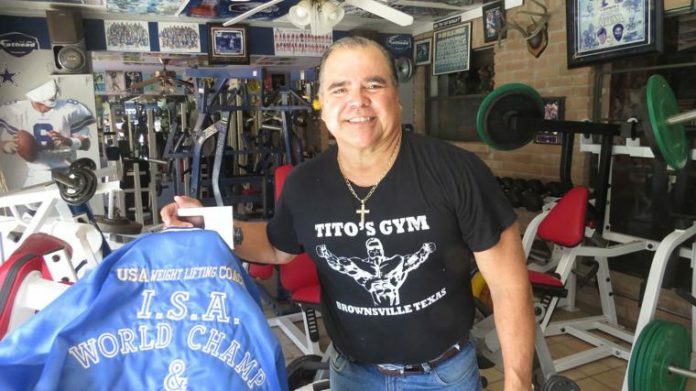 The former powerlifter and gym owner has had some success on that score, introducing powerlifting into the Brownsville Independent School District after 20 years of trying. Mata described Brownsville as a “hotbed of powerlifting” and said the city is acknowledged and respected in the sport, though he doesn’t personally powerlift anymore. Mata said he’s moved on to bodybuilding — as a judge. He was recently certified as a bodybuilding judge — the first from Brownsville and possibly the Rio Grande Valley — and will take part in a May 11 event on South Padre Island that he hopes will generate excitement locally. Mata will be judging competitors in the SPI Showdown, an amateur, pro-qualifying event that will include men’s and women’s standard bodybuilding, and men’s and women’s classic bodybuilding, among other categories. The Showdown, a Global Bodybuilding Organization competition, is part of the SPI Fit Expo, taking place at the SPI Convention Center May 11. Mata, who became a bench-press world champion in his 50s and whose home workout space is stuffed with equipment, more than 200 trophies, and autographed photos of Arnold Schwarzenegger and other old-school musclemen he admires, said he “never in my wildest dreams” thought he’d become a bodybuilding judge. Mata said he got his start weightlifting with bricks and then coffee cans filled with cement, courtesy of his father, and that the pursuit changed his life. He hopes to turn others on to the importance of lifestyle: proper eating and dieting, training, cardiovascular exercise, improved self image and the rest. Mata is banking on the SPI Showdown and other events at the Fit Expo to help generate some of that enthusiasm.